So what’s stealing your personal peace? No it’s not your VISA bill. The problem is much bigger than that. I’m convinced that the pursuit of peace is the number one priority of most people. Humans will do anything to find it and keep it. If everyone is looking for peace, why do so few succeed? In this video I will expose the conspiracy that is stealing your peace. Then you will learn how to repossess and keep it. To live a transformed life you’ve got to hold and use the keys to personal peace. Share the transformed life! Send some peace to your friends with this video. How do you win the battle for your peace? Just leave your comments below. Is your peace shattered because you can’t control your thoughts or moods? Does your mind get stuck in sad, negative and worry thinking that you just can’t shut off? 10-20% of the population is struggling with depression, anxiety and mood swings and that includes a lot of Christians. In the 2 disk set Depression, the path to recovery I demystify the causes and treatments of mood disorders from a Christian perspective. This presentation will put you or a loved one on the path to recovery. Just click here for more information and a 5 minute preview. Thanks for a primo website – there’s such a lot of great resources here that are so helpful. You were recommended to me by Denis & Coralie Clark of Business Edge, where I am also a member. I love the call and heart that God has put in you for healing the broken – you are so needed right now! Thank you for this great word Dr. Mullen. When I’m feeling the need for peace, I seek the Lord in prayer. I ask Him to reveal anything in my mind or heart that’s troubling me or needs to be addressed. Often times I just need to spend time in His presence, silent. I also find that spending joyful moments with my godly women friends helps bring peace and relaxation. Laughter is good medicine! Hi Dr Mullen..I totally enjoyed listening to this video..I recently realized that my circumstances do not dictate whether I have peace or not.I used to believe that because I’m married to an unsaved spouse, I would have so much peace when he got a job where he was only home on weekends, but that hasn’t been the case at all.While there is less strife and bickering, that peace that I have longed for in my heart and mind has still eluded me. Now, I realize peace does not have to do with outward circumstances, but an inner state of mind, a mind fixed on God and His Word. God Bless..
That’s an incredible revelation Glory. Melissa, that’s a great idea to ask God what’s robbing your peace. At Christmas I had asked the Lord for the gift of peace in this new year. “Peace is a way of life”. wow. so, I have to have an input into it! Glory, your comment about having our mind fixed on God and His Word and Melissa your comment about asking our Lord to reveal to us what is troubling us and needs addressing, are most helpful in doing our part with the Lord in achieving and KEEPING our peace. Theives,l that is what I call all those things that rob me of the peace that God intends me to have. It can be anything- that interferes with the time I smpend with God. Sometimes I find myself for no reason at odds,that is what the enemy loves to do have me obsessing over the past, or the future or whats happening here and now. I was feeling like that today and I went aside mentally and spent sometime talking to God. Today the conversation was about provision and the nasty old robber was sent off and the peace was incredible. The lilies of the field came to my mind, and how God cares about them,and they don’t stress out but just be there as a witness to Gods provision He sends the rain and the sun and the cool of the night. I have come to the conclusion that when we obsess about possessions, and how when we selfishly strive to get more we lose our peace.David in ps. 34 tells us that if we look to God for help we will be radiant with Joy. 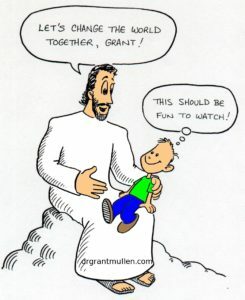 It was peaceful just listening to your words Grant and all I can add is a big AMEN brother as we all seek inner peace with our Father. I just wanted to thank-you for your ministry and for this excellent video on peace. I shared it with my congregation a week ago, when I was talking about stress and how to overcome it. They really appreciated it!! Thanks Paul. That’s a big step up if my video blogs can make it into a Sunday service!